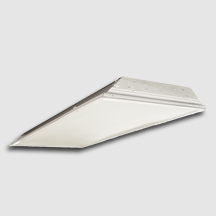 This fixture is designed for industrial, institutional and commercial applications as a direct replacement for traditional HID and fluorescent high bays. With 50,000 hours of life at L70 standard and a 5-year limited warranty the fixture maintenance cost is reduced substantially over time. Low profile body with matte white sloped side members. Thre extruded acrylic lens options available. Techlight/Horizon’s state of the art Diffusers set new benchmarks for performance in key metrics such as transmission efficiency for a given level of diffusion or hiding power, beating holographic, surface relief and bulk diffuser techniques. We enable high transmission and a pleasant uniform light at the same time. Long life LED’s and high efficiency drivers work together to provide superior performance in an efficient package to deliver optimal performance. LED’s available in 3000K, 4000K and 5000K with a CRI >82. Electronic drivers are available in 120/277 volt applications. 0-10V dimming standard.